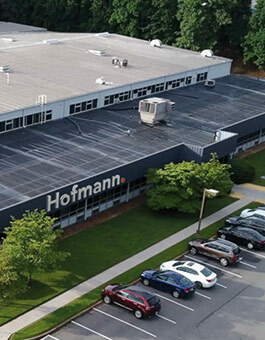 Hofmann’s business activities in North America are managed from Lynchburg, Virginia. Since 1974, balancing machines have been developed and produced here. Hofmann recognized the significance of balancing technology for the American market at an early stage which led to the founding of the American Hofmann Corporation in New Jersey in 1961. In 1974, the American Hofmann Corporation then moved to Lynchburg, Virginia. The Lynchburg plant currently has over 80 employees (2018). Balancing machines are produced on a production area of more than 8,000 sqm. American Hofmann Corporation is part of the Hofmann Group’s global strategy. Some of the machines developed and produced in Lynchburg are: universal balancing machines, balancers for rotors used in aviation as well as rotors of drive shafts, turbo chargers and electric motors. With a knowledgeable and experienced sales and service team, American Hofmann Corporation primarily supports our customers in the Americas, Asia and Oceania. The facility includes a balancing center where rotors of all types are balanced for customers. Lynchburg, which is located in the heart of Virginia, is home to many renowned companies in the field of mechanical and plant engineering. The city also offers a great variety of education and training possibilities due to its location between Charlottesville and Blacksburg, home to well-known technical universities where many Hofmann engineers completed their education. Lynchburg has good Transport links and its own airport. Do you have a request or need specific information? Here, you can get in touch with our contacts at the Lynchburg plant. We are looking forward to receiving your message.